This was the scene in the livingroom on Saturday. 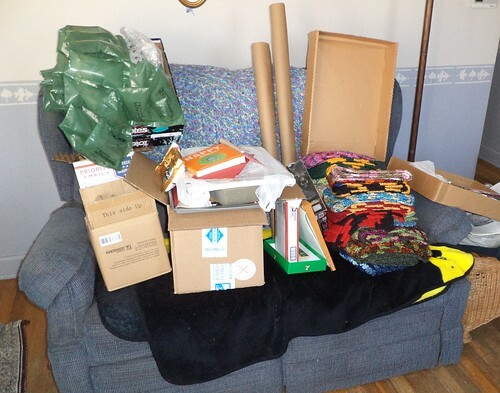 Boxes and packing materials and the scarves and the other assorted items all stacked in the recliner in preparation for shipping. I start collecting boxes about November. We get a number of pieces of equipment in various sizes of boxes all year long, but I start rooting through the stack right before Thanksgiving. I sort of have a good idea of what I need, but invariably don't have exactly the right size on hand or I lack enough packaging materials. It's never about the wrapping paper, however. That I always have. The wrapping and packing started on Saturday. There are Christmas letters to write to go in cards inserted in a box. I just started at the top of the pile and worked down. That meant I'd wrap something for one member of a family but the rest for that family was buried, so their box with all the parcels would be set aside until the next items were liberated from the pile. I have not had as much "help" as in years past, a fact I am rather grateful for. They sort of look at me askance and get out of the way. I thought I had more name tags. I should have just enough. That will be something to look at getting on the days after Christmas. 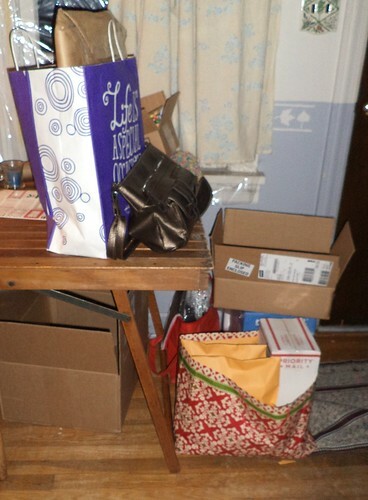 By Sunday evening, I had filled two shopping bags with parcels. I wasn't done and, as I type this, I'm still not done. But what is left will be finished tonight. I discovered the scarves easily fit into a manilla envelope which made them easy and cheap to mail. "Anything fragile, liquid, perishable or hazardous to the delivery man?" Is it wrong that I've mailed so much stuff, I immediately tell the clerk there isn't anything in the packages of that nature before she even gets the start of the sentence out of her mouth? It's a labor intensive process to wrap the scarves, address the envelope and the card, stuff the parcel into a envelope or, if it's to a family or more than one present is headed to the same address, find the right size box. Fortunately, I've received a few items in appropriate sized boxes so those are getting refilled and sent back out. It just seems to be taking far longer this year than it has in the past. Maybe next year, you all get coal. There are no Christmas decorations up in the house as I have been solely focused on getting this stuff out the door. On the bright side, a couple of the clerks at the post office know me by sight now. So, next year, when I get this urge to make a mass of people something, please remind me that I have to wrap and ship it.